Optimism abounds for the growth and development of the golf market in Vietnam. That was the message from the high-profile speakers at a Club Management Mini Summit at the Els Performance Golf Academy (EPGA), which is located within the master-planned Ecopark residential community on the outskirts of Hanoi. Held in partnership with the EPGA, Ernie Els Design and Troon, the Asian Golf Industry Federation (AGIF)-organised gathering featured presentations from industry stalwarts Wayne Johnson and Thad Bell. Under the theme ‘Growing the Game in Vietnam’, both expressed their belief that Vietnam has the potential to become an increasingly powerful golfing force in the region – and beyond. In his role as Director of Instruction at the EPGA Johnson is among the people driving the game in the country. “The Academy has been developed to help grow the game in Vietnam for the benefit of all the golf clubs here,” said Johnson, whose initiatives have included the creation of a ‘Little Easy Young Athlete’ programme. The Academy also acts as the home to the Vietnam national golf team while the first steps have been taken in creating a Train the Trainer programme. “We will help to educate and certify aspiring young Vietnamese teaching professionals and are running the programme in conjunction with the Vietnam Golf Association and Ministry of Sports and Culture,” said Johnson, whose background and expertise within the golf industry spans over three decades. Bell, Design Associate Asia Office with Ernie Els Design, focused his presentation on the benefits of developing par-three, nine-hole courses in emerging markets, such as Vietnam. A graduate of the University of Georgia with a Bachelor in Landscape Architecture, Bell has more than 17 years of experience in the golf course design industry and has been involved with courses in the United States, South Africa, Middle East and China. To conclude proceedings, there was a tour of the facilities at the EPGA. Eric Lynge, the AGIF’s Chief Executive Officer, said: “The Federation is committed to highlighting all formats and facilities which are being developed to grow new golfers. 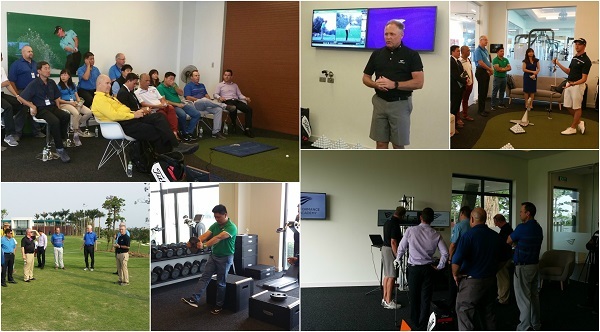 The Els Performance Golf Academy is a perfect example of an alternative facility and we thank Ernie Els Design and Troon for their hosting and educating us during this Mini Summit. “The facility which Wayne and his team is providing is top-of-the-line and certainly is a model of what can be done in other parts of Asia to introduce a new pool of golfers to the game and improve the game of existing players. “Thad from Ernie Els Design showcased how, in limited areas, a nine-hole course combined with extensive practice areas can provide a great alternative to the traditional 18 holes for the beginner golfer or those who are time-pressed to play golf. The EPGA event was third in a series of Mini Summits staged by the AGIF with previous events having been held in Indonesia and Singapore.